I am working on Creating a custom search result page with custom refiners. And I am stuck with choosing the appropriate crawled property to map to Refinable string managed property. 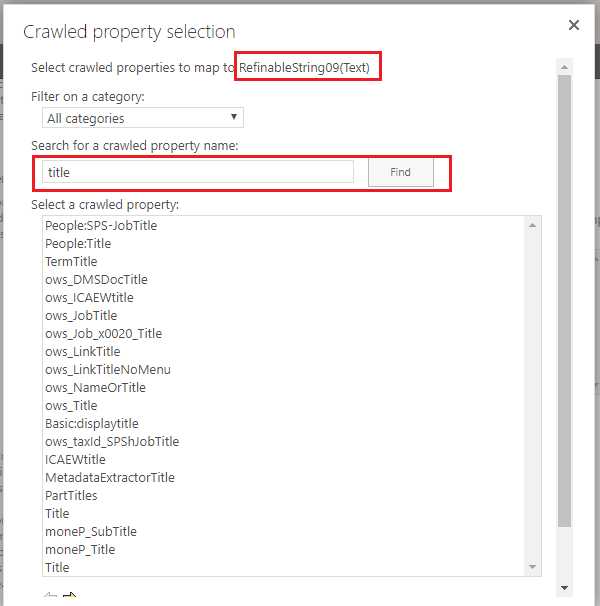 Do someone knows the exact applicable crawled property for a 'Title' field from a document library. I have already tried with OWS_Title, Title, OWS_LinkTitle. But no luck! I should point out that Title is generally a poor choice for refinement as the values are often unique. Refinement works best when a group of documents share that attribute. Not the answer you're looking for? Browse other questions tagged sharepoint-online search-results managed-property refiner crawled-property or ask your own question.